Are Cockroaches Attracted to Cardboard Boxes? Yes, cardboard boxes and paper products do attract cockroaches, for two reasons. First, cardboard is a food source for roaches, and second, it also provides a nice dark and warm place for a roach to hide and live. So an attic, storage room, or warehouse full of cardboard boxes is, for roach, like being able to live in an all-you-can-eat buffet restaurant. A roaches existence is consumed with the search for food, water, and shelter. Cockroaches are omnivorous and will eat just about anything. Cardboard is of course made out of paper, and paper is made out of trees. That means cardboard is an organic material and will be consumed as a food source by cockroaches, even though we humans wouldn’t consider it as such. Roaches are especially attracted to old, rotting, and wet cardboard because not only is it a food source but it is also a source of water. 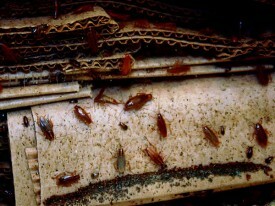 Rotting wood and cardboard are already in the process of decay, and are easier for roaches to consume and digest. The smell of wet cardboard and paper is delightful to a roach. Roaches love to live and breed in the dark recesses of closed cardboard boxes. If you have a roach infestation, check the inside of any cardboard boxes used as storage containers in your home to see if there are any signs of roach feces inside. You can identify roach poop as small, oblong brown pellets. If you find roach droppings, it is a sure sign that roaches are using the boxes and their contents for food and shelter. In order to keep roaches away, it is best not to store items in cardboard boxes. Instead, utilize storage containers made from plastic or some other non-organic material. Be sure any cardboard boxes are kept dry and are not stored directly on the floor. Cardboard absorbs any water on the floor and once wet starts to rot quickly. Wet cardboard is a roach magnet and will continue to be, even after it dries out. Roaches are attracted to all paper products, not only cardboard. To keep cockroaches away, you must be concerned with not only cardboard, but any paper product like old books, paper bags, and even wooden furniture. Remember that roaches love to eat wood and in the forest can often be found foraging inside rotten logs and tree stumps. Roaches are problem in many warehouses and storage areas because of the usual ready supply of cardboard and paper products for them to eat. Get rid of any old books and wooden furniture that you don’t need anymore. And especially if any of them show signs of decay, dispose of them at once to prevent them from attracting cockroaches. We were told that storing seasonal items in cardboard protects them in a hot climate. But it makes sense that cockroaches would be drawn to cardboard. Sounds like everything in the attic should be in heavy duty totes? The big plastic storage containers are perfect. Roaches can’t eat them. While cardboard in and of itself does not attract bugs, the situation of it does. Think of how cardboard boxes are used for storage, and left untouched and undisturbed for sometimes long periods of time. Actually, I think the cardboard itself does attract roaches — they eat it.